NACOGDOCHES, Texas - The Swingin' Axes and Swingin' Aces jazz bands at Stephen F. Austin State University will perform the music of Duke Ellington, Oliver Nelson, Sammy Nestico, Thelonius Monk and other jazz artists when the student ensembles perform at 7:30 p.m. Thursday Nov. 29, in W.M. Turner Auditorium on the SFA campus. Directing the Swingin' Axes is Dr. Deb Scott, professor of trombone at SFA. Swingin' Aces director is Dr. J.D. Salas, associate professor of tuba and euphonium. Guest saxophonist Carlos Casso will perform with the Swingin' Axes on Ellington's "In a Sentimental Mood," arranged by Mike Tomaro, and "Do Nothin' 'Til You Hear From Me," arranged by Tommy Newsom. Casso is a professional saxophonist who is active in the Amarillo area music scene. 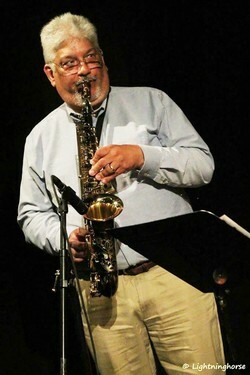 His small jazz group, The Martinis, performs regularly at many jazz events, including Amarillo College's "June Jazz," Center City's "Jazztober" and Chamber Music Amarillo's "Jazz on 6th Street," as well as a variety of other private and public performance engagements. Under his leadership, the Amarillo Jazz Orchestra has shared big band literature with a wide array of fans and was featured on two PBS specials for KACV-TV. Casso's eclectic style is influenced by his vast playing experiences ranging from jazz to classical, country swing to rock and roll. He received his music business degree from West Texas State University and owns Audio Refinery, a professional recording studio in Amarillo. Casso will be joined on stage by his son, Dan, who is a senior music education major at SFA, trumpet player in the Swingin' Axes and a recipient of the Sidnell Memorial Dean's Award in Music Education. Together, they will perform "Emancipation Blues" by Oliver Nelson. The Axes will also perform "Channel One Suite" made famous by the Buddy Rich Big Band and arranged by Bill Reddie; an arrangement of an African song, "Mra Khali" by Dudu Pukwana, arranged by Julien Arguelles; "Tall and Lanky" by Jeff Coffin; and "Show Up" by Michael Davis. The Swingin' Aces will perform "Blue Chip" from the library of The Count Basie Orchestra and "Tangerine," from the 2009 Sammy Nestico album "A Portrait of Sammy. Maximo Mucino, jazz teaching assistant, will also conduct Mark Taylor's arrangement of "Well You Needn't" by Thelonius Monk.